A beautiful collection of designs suitable for sending as a gesture of sympathy to the family of the deceased. The flowers that accompany a funeral are, to many, an important way of paying respects to the family and friends of the deceased, and a decorative feature of such ceremonies that adds colour, class and memorialises the deceased. 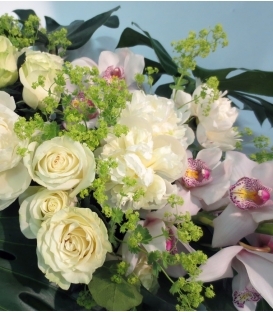 Choosing such flowers for funerals can sometimes be a tricky business, but with Pourquoi pas fleurs’s range of tasteful, sophisticated and carefully arranged flowers, you can be sure of the right selection. 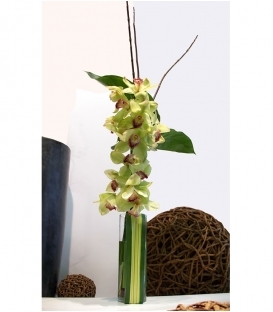 B23 Orchid Stem Exquisite arrangement with sober design enhancing a green cymbidium orchid from Asia. This arrangement is tall and structural. 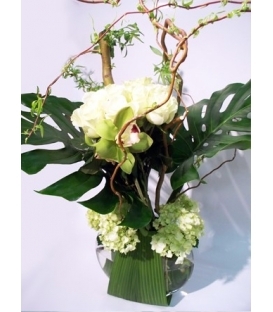 It is designed with anthurium and pendanus foliage from South America. 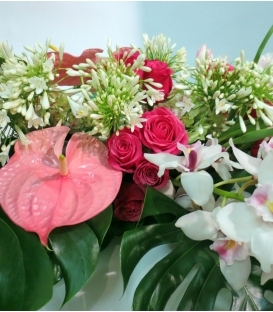 The colors of the orchids can be different according to the arrival and the type of foliage. B37 Bouquet white roses & Hydrangeas Exquisite bouquet with sober design white roses and hydrangeas from South America. This chic arrangement is structural and designed with lysianthus from Ontario and exotics foliages Monstera from South America. Phalaenopsis Orchid Magnificent blossoming orchid plant designed with seasonal branches. This orchid is in bloom with more than six open flowers and buds. It is placed in a contemporary black or white cubic pot. The plant can easily be taken out from the pot for watering. Instructions are added to the wrapping. 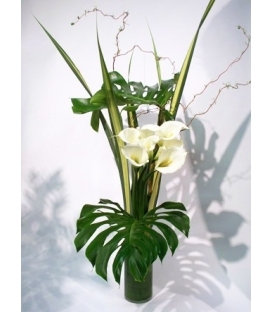 F5 Tall Calla Lilies Floral arrangement with white calla lilies used at their full length from South America, monstera leaves, tall pendanus foliage and seasonal branches. The flowers are inserted in a cylindrical glass vase. The stems are then covered with coco leaves. The vase is included in this modern arrangement. 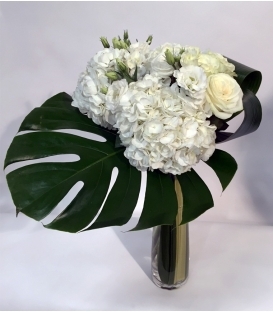 F6 White Roses Funeral design with white roses from the most beautiful Equator greenhouses, green hydrangeas, large monstera leaves and seasonal curly branches. The flowers are inserted in a lunar shaped glass vase covered with a coco leaf. This unique vase is included in the price. This arrangement can easily be brought back home. 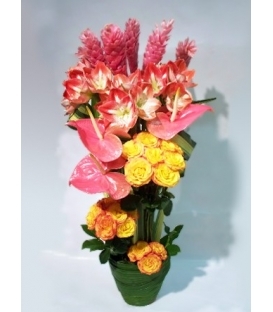 F7 Tall Colourful Funeral arrangement composed of amaryllis flowers, pink gingers, pink anthuriums and colourful roses from the best Equator greenhouses. It is stylised with tall pendanus foliage. The flowers are inserted in a terracotta pot filled with humid floral foam wrapped with a coco leaf, giving it a tropical feel.